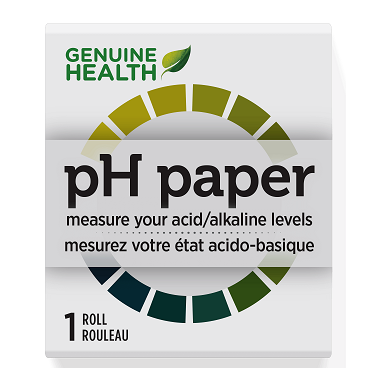 Genuine Health pH Paper is a roll of pH paper to test acidity. Did you know your pH level impacts your overall health – including your bones, skin, digestion, and body weight too? Studies show our pH level should be more alkaline, however most people are acidic due to diet and lifestyle choices. Using the simple, at-home pH test with Genuine Health pH Paper, you can measure your level using urine or saliva. You can also become more alkaline in just 7 days by following our acid/alkaline food guide, and including greens+ daily! Easy to use compact easy to read results. Will buy again. Its a pleasure to buy here low prices supper fast shipping. Really like this ph strip product. Works really well, and tells me when my body is too acidic. So glad I have found this product here. Works great, too! I really love this product! This works so great and it helps me to know when my body is acidic or basis. I also use this to time a baby gender along with my ovulation test. Highly recommended it. works great and are very accurate.